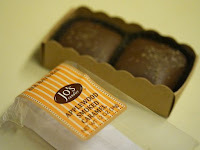 Jo's Candies (Torrance, CA) "California-crafted" today's Applewood Smoked Caramel (package of two pieces). It's hard to go wrong with chocolate-covered, smoked salt caramels. This blend of flavors seem to naturally hum together in perfect harmony. The Applewood smoked salt in today's chocolate helped balance the generous slab of sweet, chewy caramel filling. 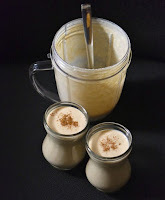 To inject a bit more apple into this caramel experience, I paired these Jo's caramels with a small caramel apple milkshake (made with fresh apple slices, caramel sea salt gelato, dulce de leche ice cream, a micro-splash of Calvados (apple brandy) and sprinkle of apple pie spices). It was either that, or call a local ice cream spot—Tin Pot Creamery (Palo Alto, CA)—to see if their baked apple sorbet was in stock. I didn't get around to the latter, but both would have been good apple-y sweet choices.